How do you respond when you experience an overwhelming urge? You’ve had this experience before, no? Although you made a commitment to stay clean, you find this hunger within to turn back to your old habits. Your mind may start producing images of things you’ve seen in the past. Thoughts start racing through your mind about how great it would be to have just one little look. And then your heart becomes attached to the idea of indulging even if only a little bit. And then the response becomes physiological as well – your heart starts beating a bit faster, breaths are shallower, you may feel irritable, angry, anxious, distracted. Many, when they experience such temptations, see it as a problem, assuming that they should not feel this way. As a result, they resist the urge, try to take their mind off of it, or pretend it doesn’t exist. When it grows stronger it’s seen as a failure and an indicator that you will relapse. What if I told you people who break free don’t do it because they somehow eliminate the urges or make them weaker, but rather they simply change how they respond to the urge. Rather than seeing the urge as a problem, they take it as a reminder of their slavehood to Allah and their neediness of Him. Since they are not focused on resisting, they are able to fully acknowledge the fact that they are feeling triggered at the earliest signs. Since they are aware of their vulnerability, they immediately take action by stopping what they’re doing and getting out of the danger zone and reaching out for support. They recognize that they are experiencing the temptation because there is some imbalance in their life. Maybe there’s some unresolved conflict, maybe there’s an emotion that has been smothered down rather than acknowledged, or maybe they’ve just been overworking themselves and they need to give themselves some rest. In other words, they use the urge as a compass to tell them when they need to return to balance! As they stand strong in this way, slowly but surely they return back to a balanced state where they don’t feel triggered any more, and they stand tall and they express their gratitude that Allah enabled them to surrender to Him in the face of temptation. The key thing is that they haven’t eliminated urges from their life, but rather they learned how to respond in an uplifting way, and as they practice this new response becomes more and more second nature. I’m going to share with you the 5 steps you can take when faced with the temptation to indulge so that you can respond in a way that uplifts you as well! STEP 1: RECOGNIZE THAT YOU ARE IN DANGER! People frequently ignore the signs of danger or they simply don’t recognize the signs of danger. So how do you recognize that you are in danger? The way to do so is to know the signs of danger by carefully observing what happened when you relapsed to your unwanted habits in the past. What was the day of the week and the time of the day? What kind of events were taking place? Most importantly, what kind of emotions were you feeling? What kind of thoughts were you thinking? How did you feel physiologically? The best way to gather this data is writing! As long as this information stays in your head, your mind can ignore it, but the moment you write it down it dramatically increases your awareness and your ability to recognize when danger is coming. When you recognize danger, you have to sound the alarm. You have to create something that forces you into action. Wake up! Move! Get out the way! When Yousuf Alai’hissalam was being seduced by the woman he worked for, he immediately said “ma’ath Allah!” (I seek Allah’s refuge!) – he acted right away! He sounded the alarm! What can you do to sound the alarm when you recognize danger? STEP 2: GET OUT OF THE DANGER ZONE! You can always choose to uplift yourself rather than to indulge. Even if you have a little slip. Even if you take a second glance. It doesn’t mean that you’re doomed. OK, actually, it only means you’re doomed if you do nothing. So ask yourself, where can I go when I need to have an extra layer of safety so that I can address the danger? The masjid? Go outside for a walk? Somewhere in your house you can be without any media? Make sure you leave all your valuables behind – nothing else matters right now! Yes, that means work can wait. Yes, it means you may need to step away from your family and friends. Ultimately, your work and your relationships will benefit if you stay clean, therefore you are doing them a service by stepping away to take care of the danger. STEP 3: GET OUT OF YOUR HEAD! The decision to indulge is a decision to pursue a fantasy rather than reality. When you are in your mind, your mind can make you think that reality is unbearable and the only way to feel peace is to indulge in your fantasy. So staying in your mind will NOT help! Sometimes we have long conversations in our mind, hoping that we can think ourselves back to sanity. However, insanity is created in the mind, so when your mind is not serving you well it’s time to get OUT of your mind. So how do you get connected with reality and find peace? 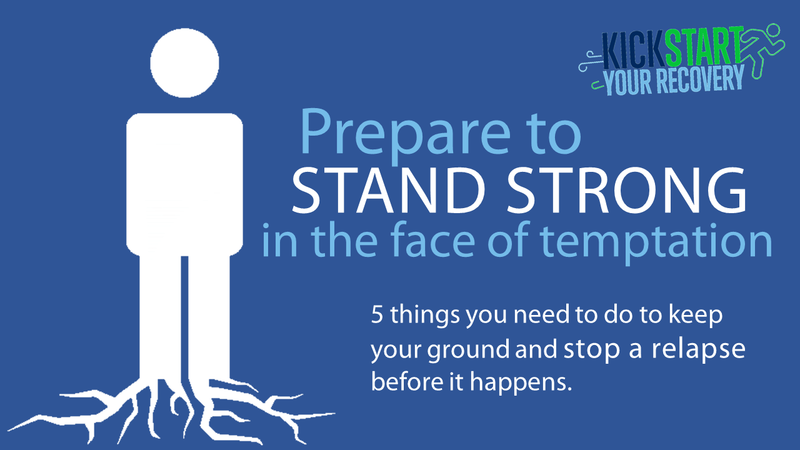 Download the “Standing Strong” exercise to learn how to calm yourself when faced with temptations. STEP 4: REACH OUT ASAP! It’s so tempting to believe “I got this! AlhamdulAllah! Problem solved!” but the truth is that we as human beings need other people. This is simply how Allah created us. This person could be a trusted friend you can safely share your struggles with – of course it can seem difficult to open up to someone like this, but many members have also found this experience very liberating because it allows them to be their true selves without a mask. You should have an understanding with this person that you will reach out to them when you’re in trouble no matter what time of day or night it is. If you’ve made it this far, then you are likely to stay safe this time around, which is great. But who knows if you will be as strong tomorrow? So your ultimate goal is to come out of the situation STRONGER than before. Why does all of this trouble you went through matter? Why are you making it a priority in your life to eliminate these behaviors? Why didn’t you just say “oh, well, it can wait until tomorrow…”? Ultimately, no one breaks free from bad habits because one day they make a strong commitment and have a eureka moment. Rather, they achieve a lifetime of freedom when they face each moment as it comes and work to make each moment a victory. By having a plan ready, you will be empowered to RESPOND to the urges in an uplifting way, rather that consistently feeling like you resisted and resisted and ultimately you were overpowered. Remember, the key is not to merely RESIST the urge, but to RESPOND in an uplifting way! Very good and practically helpful with other general issues too. Jzk! Happy to hear you found it helpful, wa iyyakum! !